Thursday marks the 25th anniversary of the death of John Lennon. His image and music are still extremely potent and popular - but how does his widow Yoko Ono control his legacy? When musician Ian Watts put together a stage musical to tell John Lennon's life story, he thought he was paying harmless tribute to the greatest artist of the last century. But Ono was not willing to put her late husband's reputation in the hands of a project she had not approved. Mr Watts was about to give Lennon: A Day in the Life two low-key test performances when Ono and Sony/ATV, who own publishing rights to the music, found out and stopped him in his tracks. 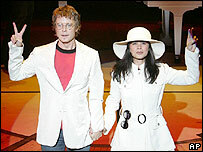 "Your head's above the parapet and Yoko's crosshairs are firmly fixed on your forehead," he was told by their lawyers. "It was a very, very scary time," Mr Watts says. "I was amazed that they found out about this. "I was absolutely blown away by how hot they are, how quick they were off the mark and how solid it was." Mr Watts says he was merely "naive" about needing permission from Lennon's estate. But he now agrees they are right to keep a firm grip on Lennon's legacy. "What they're doing is protecting the names of The Beatles, John Lennon and Paul McCartney. And they have to be really looked after. "So it's important that people like me don't come along and make a mess of it. Of course, we weren't intending to make a mess of it." He was told to take out any trace of storyline - and so a new tribute band-style concert show, Come Together Right Now, finishes its UK tour at the Liverpool Empire on Sunday. Ono is notoriously protective of her late husband, threatening to sue a painter and taking legal action against a Tokyo underground operator for using his image. But, as any Beatles fan will know, products and projects using his name and music are hardly thin on the ground. 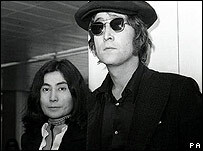 US magazine Forbes estimates Lennon's estate earns $22m (£12.7m) per year - mainly from CD sales. Ono has just put together a new greatest hits compilation, Working Class Hero, which was released in October. She also backed a Broadway musical that closed after just six weeks following poor reviews. Lennon merchandise such as sunglasses, figurines, plates, watches, trainers and baby accessories has also been approved. But proceeds from many of these go to charity and Ono has also donated some rights to organisations like Amnesty International. Ono's representatives declined to comment on her activities. Bill Harry, a friend of Lennon who ran the Mersey Beat newspaper in the 1960s and wrote the John Lennon Encyclopaedia, says Ono has an "iron grip" over what is released. "Yoko controls everything," he says. "John doesn't belong to the world any more. He belongs completely to Yoko, who is able to filter anything that goes out. "Everybody has to have her permission for anything - which is why we have the most abominable stuff coming out on John." The Beatles were the first band to create their own merchandise industry, according to The Times chief rock critic Pete Paphides. 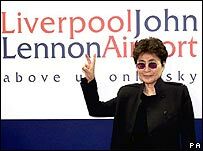 But now, Ono is devaluing Lennon's messages by using lyrics on products such as Nike's Converse Peace trainers, which feature words from Imagine, he says. "I think it's probably a misguided attempt to keep him remembered," Mr Paphides says. "I think in Yoko's world there's no major conflict between licensing someone's name and keeping their memory alive. "There's this sense that by buying a Converse trainer you might somehow be tapping into the message of songs like Imagine and I think that's what sticks in the craw slightly. "I don't think her intentions are malign, I just think she doesn't see any great conflict in all of this." But her actions have reduced Lennon to a cliche, he says. "I guess that's part and parcel of iconhood - maybe in order to become an icon you do have to be reduced to this cliched, more well-rounded, smoother version of what you were."